Since we collect records ourselves, we buy lots of records. But when you buy large lots of records at auctions and sales, you often end up with vintage records which are so scratched or damaged that they are unplayable. We don’t like to throw anything out. (Who wants to add to landfills?!) So we often try to recycle or upcycle old things to give them new life. We’ve made plenty of bowls and organizers from vintage “ruined” vinly LPs, but we’ve long wanted to make use of the smaller 45 RPM records. Since the annual Fargo Street Fair starts tomorrow, we thought now was the time to get our butts in gear and turn “thinking about it” into “doing it”. So we got out the scroll saw and made some coasters! 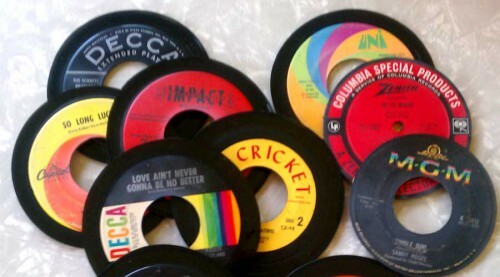 Today, I just brought stacks of these coasters (and other items made from vinyl records) into Antiques On Broadway. As we make more, we’ll likely bring some to our other locations as well. Along with the cool graphics and personal nostalgia tied with music, there are some song titles which seem especially well-suited to their new lives as drink coasters — such as Ed Ames’ My Cup Runneth Over. 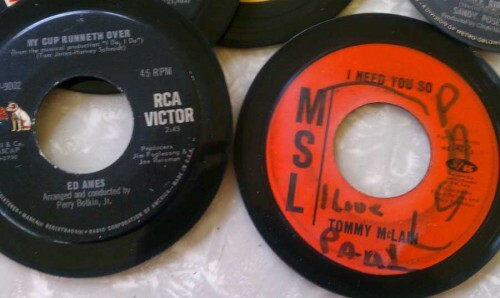 My personal favorites are the ones with marks from the original owners — like this one marked “I love Paul”. Of course, finding some stacks of wax by The Coasters that are too damaged to play would be the ultimate records to turn into beverage coasters! But still, there’s something for everyone, really, with these charming yet practical recycled vinyl pieces.